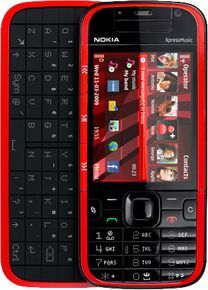 Nokia 5730 XpressMusic is currently not available in any stores. Watch your favourite video songs and movies in video player. It supports MPEG4, H.263, 3GPP, RealVideo 7, RealVideo 8, RealVideo 9, RealVideo 10, Flash Video file types. Listen to your favourite songs in music player. It supports MP3, AAC, AAC+, eAAC+, WMA, WAV, RA etc. file types. Whether you call it Eseries in baggy jeans and headphones, or XpressMusic on steroids, the 5730 will raise its QWERTY hand. What are you gonna do? Hit the streets in a cheap sporty roadster (5630) or a budget crossover (5730), which rides like dad's luxury sedan (E75)? We guess the carmaker (Nokia) will be happy either way. The Nokia 5730 XpressMusic has plenty of decent features that should make it very attractive, and it delivers an exceptional music performance. But overall it has a hybrid feel to it that helps make its design less than appealing.